coir , ec meter . . . .coir conductivity meter , \SPECIFICATION: •	RANGE : 19.99 MS/CM •	RESOLUTION : 0.01 MS/CM •	ACCURACY : ±2% F.S. 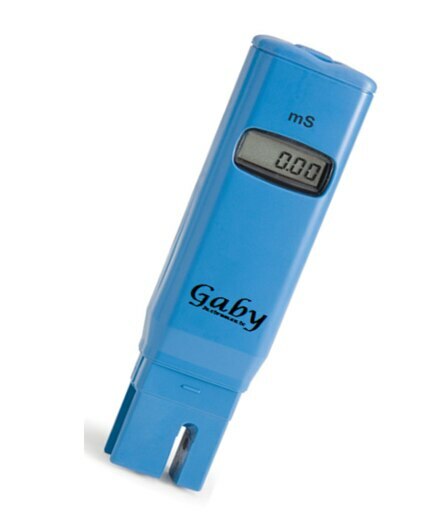 •	CALIBRATION : MANUAL, 1 POINT •	TEMPERATURE COMPENSATION : AUTOMATIC, 0 TO 50°C (32 TO 122°F) •	BATTERY TYPE / LIFE : 1.5V (4) / APPROX. 200 HOURS OF CONTINUOUS USE •	ENVIRONMENT : 0 TO 50°C (32 TO 122°F); RH MAX 95% •	DIMENSIONS : 175 X 41 X 23 MM (6.9 X 1.6 X 0.9”)  WEIGHT : 95 G 3.4OZ.) SUPPLIED WITH PROTECTIVE CAP, SCREWDRIVER, BATTERIES AND INSTRUCTIONS.